We don’t learn much about Rango’s life as a pet lizard. In fact, his name is not even Rango; he adopts it as his identity during his adventure. We do see him create his own theatre productions with the random items in his tank and he pretends that they give him feedback and criticism. When he determines that his latest show needs some intense conflict, he finds himself flung from his tank and on the side of the dry desert road. At the advice of an old armadillo (Molina), he seeks out water and stumbles upon the town of Dirt, a classic Wild West locale full or critters and experiencing a nasty drought. Johnny Depp quickly loses himself into Rango, a character that’s somewhere between his take on Willy Wonka and his turn as Hunter S. Thompson. Depp churns out an outstanding animated protagonist, one who is equal parts boisterous and insecure. As the ultimate outsider in Dirt, our lizard hero has an epiphany: he can reinvent himself out here. He takes up his new name and makes up a fantastical tall tale and then with a pinch of luck, becomes the toast of the town and gets anointed sheriff. All seems swell, but something’s up in the town with regards to the dwindling water supply and the local critters are getting restless. Rango must truly be the hero he masquerades as. The creatures of Dirt are fascinatingly animated. They are gritty and unpleasant looking, but awing in their detail. 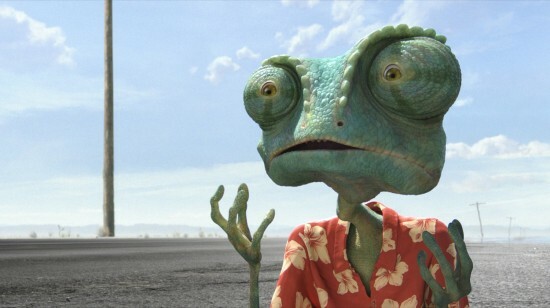 Rango’s facial expressions even out-Depp the man behind them as embodied in the scrawny asymmetrical lizard. The animators do a particularly fine job of creating the hot and dry climate of the desert, enough so to recommend that the film is best enjoyed with a beverage in hand. It’s so effective that it magnifies the problematic nature of this simple predicament done hundreds of times before. Hidden underneath it all somewhere has to be an environmental message, but not an overt one and not the main lesson to learn from the story. The language and texture of the film might be decidedly adult, but the conventions of the story and the degree of action aims specifically for children. Rather than aim for a middle ground, “Rango” somehow takes the highest road and the lowest road simultaneously. The dialogue and the situations are sophisticated but the physicality of the characters and the high-flying Western frontier action still plays to a child’s understanding. This only proves that “Pirates of the Caribbean” director Gore Verbinski has a real gift for all-ages entertainment. In addition to Rango’s existential quandary, children will not understand the cinematic homages either, particularly to spaghetti Westerns. One of the film’s most affecting scenes comes at the moment when our animated hero, as they all do, hits the lowest of lows after he’s exposed as a “fraud.” Rango has a run-in with “The Spirit of the West,” an instantly recognizable figure who has some old-fashioned advice about toughness and walking tall on the path you’re given. It’s a tender moment as what has been considered a bygone era of cinema plays an important thematic role in such a modern mainstream story. “Rango” doesn’t quite capture the degree of humor and emotional depth that the Pixar greats of the last few years have, but it’s a fun adventure with exquisite animation, tasteful characters and a good heart, which puts it as an above-average offering compared to others of its kind. Adults will simply marvel at the intellectual boldness of this pure and simple kids movie and rightfully so. Only with a Pixar gold standard in place does “Rango” come across as flawed; otherwise it’s an absolutely pleasant watch from start to finish.